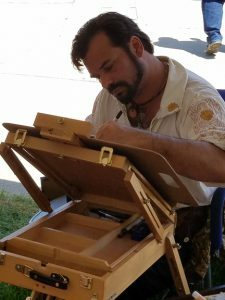 Laughing Dawg Studio spends the majority of the late spring through early fall traveling the upper midwest providing caricature vending services to a variety of renaissance faires, festivals, and dog related events. However, there are still spaces in our schedule that we can fit your event into! Laughing Dawg Studio provides your guests with a fun experience and a memento or keepsake of your special event. This special and personalized touch will ensure that your event will be remembered by your guests for years to come. We strive to make every interaction a unique and special experience filled with laughs. What kind of events do we provide services for? Birthday parties, company parties and picnics, charity events, festivals, fairs, graduation parties, trade Shows, and weddings to name a few. 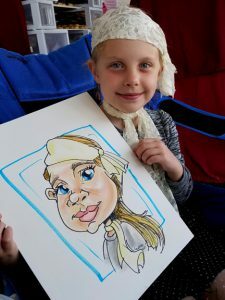 So what can you expect when you hire Laughing Dawg Studio to provide caricature services for your event? We’ll arrive 30 minutes before the contracted start time to touch base with the client or their representative and set up. We will bring our own materials and easel. The client will be responsible for providing me with 3 chairs, unless otherwise specified. We begin drawing at the specified time and continue to draw and entertain as many people as we can until the specified end time. Should the client desire us to stay longer, provided that it works with our schedule and for an additional fee, we will do our best to accommodate you. On average, we draw about 10 faces per hour in black and white or about 5 faces per hour in color. We can work from photos, however the guests attending and sitting for us have priority. Hourly rates. We have a 2 hour minimum for all bookings. Mileage rates may apply for events more than 50 miles from Madison, WI. Please E-mail us to provide a quote or to book your event. This can be done through our contact page or just click on the envelope on the right hand side of the screen.